Since 1987, the University annually, with the support from First Citizens Bank, presents this award to recognize and foster the advancement and diffusion of knowledge and creative endeavors. Mukherjee, who also is chair of the Department of Biological Sciences in the College of Liberal Arts & Sciences, is a leader in transforming how cancer is diagnosed and treated. She has designed innovative approaches that more accurately detect breast cancer early, and she is developing targeted therapy and imaging for pancreatic, ovarian and colon cancers. Mukherjee’s groundbreaking cancer research has produced a U.S. patent and has resulted in grants from the National Institutes of Health, the U.S. Department of Defense and the Susan G. Komen Foundation totaling more than $3.5 million as principal investigator and more than $500,000 as co-investigator. “Pinku Mukherjee’s research not only has the potential to make possible early detection of cancers to allow early therapy but also to avoid unnecessary surgical procedures in people who do not have cancer but receive positive results in current tests that are notorious for their high rate of false positives,” said Mark Clemens, professor of biological sciences at UNC Charlotte. In 2011, Mukherjee co-founded OncoTab Inc., a UNC Charlotte biotechnology spinoff company that is launching its first product (a simple blood test) that aids in the diagnosis of breast cancer for women in which a mammogram fails. She holds several patents for the development of a novel antibody that has applications in molecular diagnostics and anti-cancer therapeutics. OncoTab Inc. has won several awards including one from NCBiotech as well as the grand prize at the Charlotte Venture Challenge. Mukherjee earned a bachelor’s degree in microbiology from Bombay University, India, and master’s and doctoral degrees in applied immunology from the University of London. She completed postdoctoral training at Pennsylvania State University and held faculty appointments at Indiana University Medical Center and the Mayo Clinic. Mukherjee was the 2015 recipient of the O. Max Gardner award, the highest faculty accolade given by the Board of Governors of the University of North Carolina. 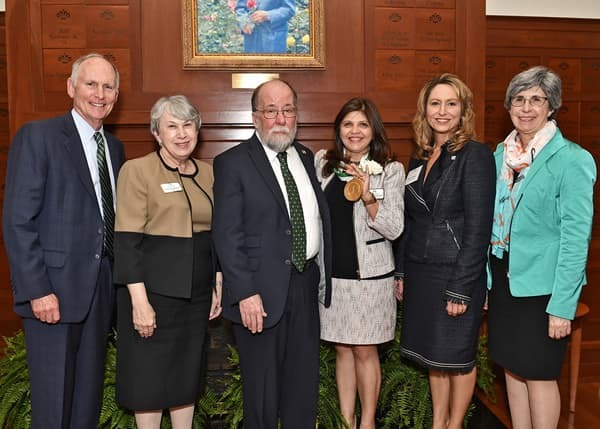 The First Citizens Bank Scholars Medal was created to spotlight the important contributions UNC Charlotte and its faculty are making, not only in its community, but also throughout the Carolinas, the nation and the world. Past award recipients have influenced scholarship in a number of academic disciplines and fields, including engineering, psychology, sociology, anthropology, biology, history, arts and education.